Ever show up to a spot where the waves are only breaking backside...but you don't know how to surf backside?! You paddle out anyway, only to fumble around trying to stand up, as thoughts of spending the day riding switch-foot run through your mind. Well, worry no more! Below are some standard backside riding tips for the next time you find yourself in this situation. Backside, in case you don't know, is when you surf with your back to the wave (left for regular stance, right for goofy). It's a little unnatural because you are not facing the wave, which is why most folks learn to surf this way after getting comfortable surfing frontside. But if you can get the hang of it, a good backside wave can be a beautiful thing. Plus, it's always nice to be comfortable riding both directions in case the day calls for it. This is how I learned to take off going frontside, so why would it be any different going the other way? As you're paddling, keep an eye on the shore and the line of the wave. Right before the wave catches you, split the difference between the two -- that's your takeoff point. If you find yourself nose-diving, or if you're on steep waves, take off a little closer to the wave line (25-degree angle) to give yourself a head start. Riding backside can actually help with steeper waves, because you can lean into the wave for stability and still keep riding (see #4). Standing straight up is every beginning surfer's worst enemy -- you have to stay low to keep your balance! If you're going backside, it's probably more important to stay low, especially during takeoff, and keeping a knee down really helps with this. Then, after you get ahead of the breaking water, you can get up on both feet and try some maneuvers! A really solid backside ride. Think of a tripod versus a dipod (not sure if that exists) or a monopod -- if you're stabilizing a camera, which one is the most solid? Front foot planted, knee down, and hand on the rail = the trifecta of backside riding. You will be way more stable and ride longer if you keep your hand on that rail. 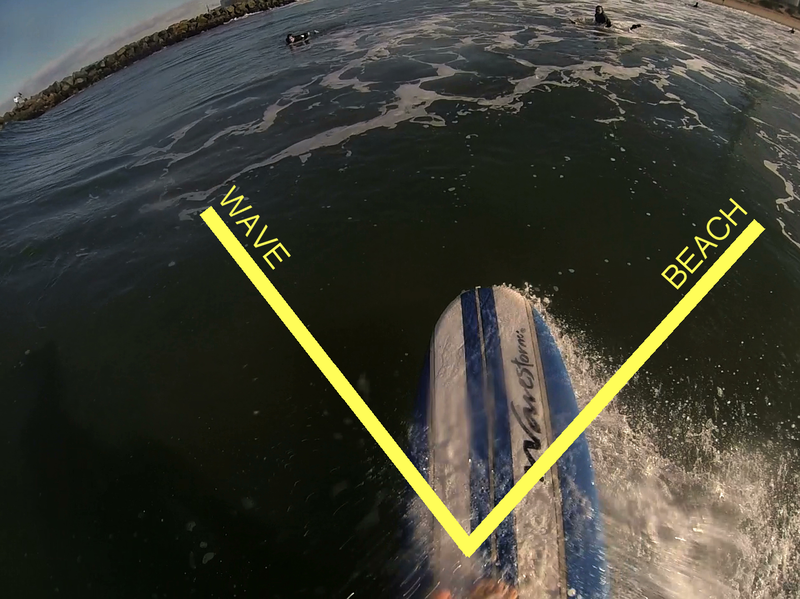 You can also apply pressure to the rail to move up and down the wave, keeping yourself in the best spot possible. This happens more naturally than anything, but having that little extra stability and counter-weight can make a big difference in your balance. It also looks awesome when your inside hand is skimming the water as the wave breaks behind you -- the surfer's alternative to walking away from an explosion without looking! After riding backside for a few years, I tend to have more fun and feel more in-control going this direction than frontside, contrary to what is common. Give it a shot and let me know how it goes! Your best ride ahead may be a backside one! Once you've got this down, check out how to bottom turn, a good next step after you've nailed your backside and frontside takeoff.